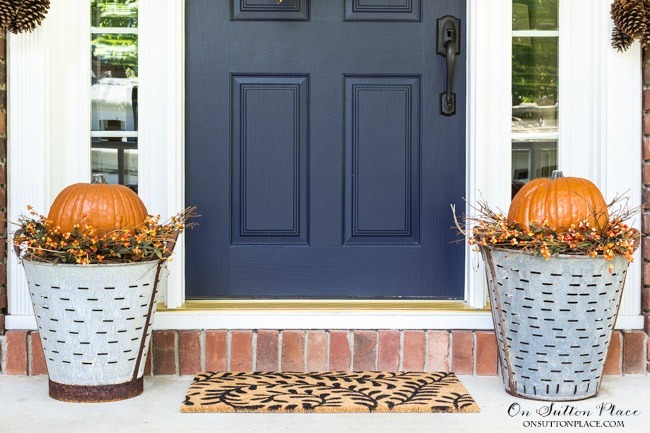 As promised, I’m popping in today to show you how to make two olive bucket pumpkin planters in under 30 minutes. When I started this project, the main thing I needed to figure out was how to lift the pumpkin to the top of the bucket. 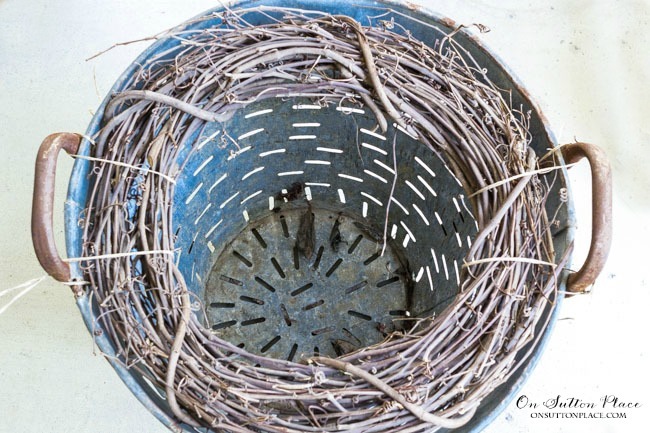 There are probably a few different ways to go about this but I decided to attach a grapevine wreath just inside the top of the bucket. I was able to float the pumpkin on the wreath and also provide a base to attach the bittersweet garland. This was quick and super easy. Take the inside top measurement of your bucket and then purchase a wreath that is as close to the same size as possible. If it’s a little smaller that’s fine…if it’s a little too big just trim the vine around the outside of the wreath until it fits. Wire the wreath to the handles as shown in the picture below. Make sure and wrap the wire around the handles so it stays in place. Next, set your pumpkin on the grapevine wreath and sort of nestle it in if you can. Now decide which side will be the front and which will be the back. On the back side, attach one end of your garland to the wreath with wire. 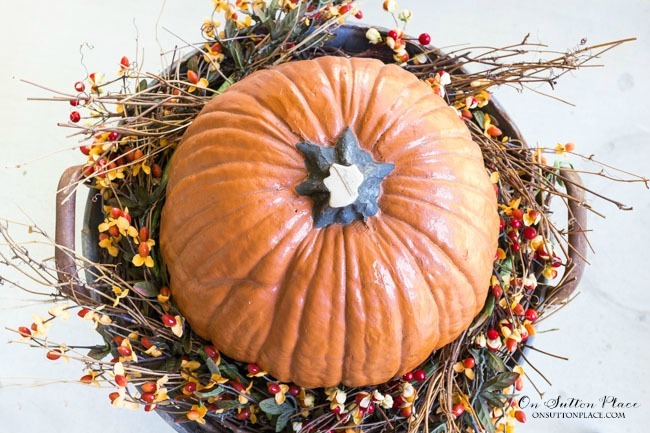 Wind the garland around the pumpkin, attaching it to the grapevine wreath in two or three places. The garland is actually what will hold the pumpkin in place. 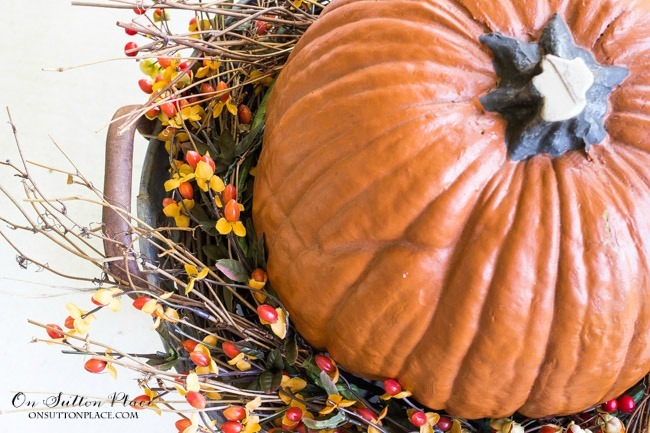 After the garland is wrapped around the pumpkin, secure the end to the grapevine wreath. Depending on the size of your bucket and length of your garland, you may have to overlap the garland a little. Or if you want the two ends to meet, just trim the garland to fit. You could use this same method with any sort of container as long as it has handles, or something to attach the wreath to. Let me know if you have any questions…thanks for stopping by! I love them!! 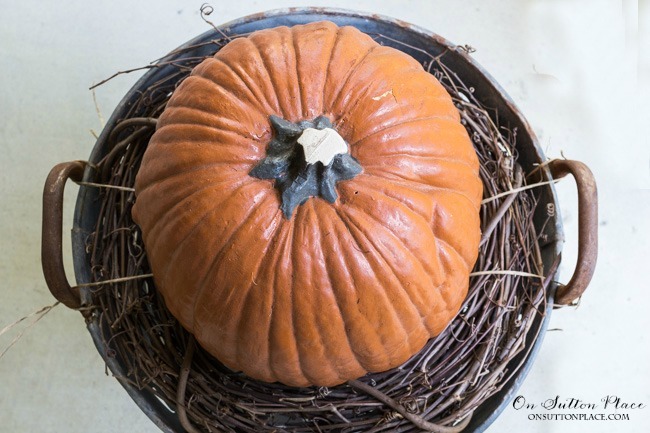 I was thinking while reading your tutorial…I have the artificial pumpkins, a metal bucket (right now it has lavender in it, but I need to get it in the ground for winter), a grapevine wreath, and a leaf garland. No, not as lovely as your olive bucket and bittersweet garland, but I can create the essence of it. Thanks for the tutorial. I enjoy your photos and you have great style. I love the natural look of your front porch. The wreath on your front door is so pretty. What kind of flowers are they? Great Idea thank you . Did you use real pumpkins ? I ask as I have a squirrels that love to nibble. Just lovely! Thanks for the inspiration and instructions. 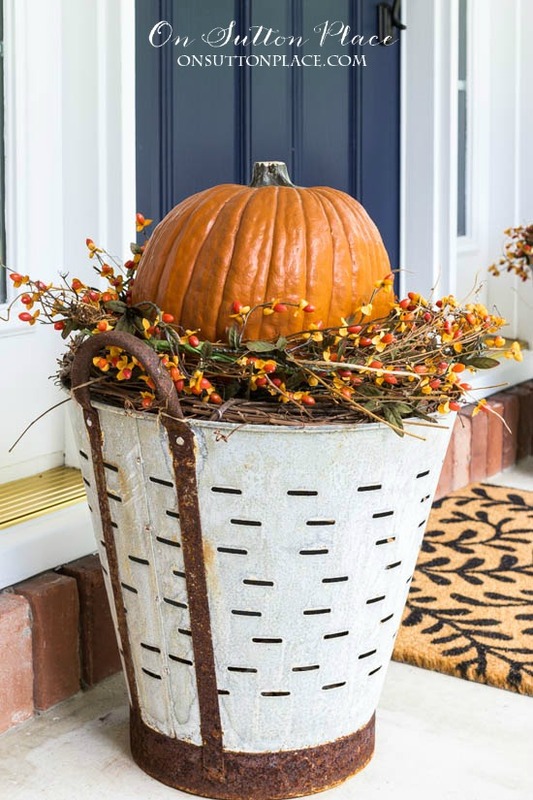 Well, I don’t have an olive basket but I do have a sap bucket, a small pumpkin and a grapevine wreath so I think I’ll try this idea. Thanks Ann! Happy Fall to you!! Love this idea. I just got my first olive bucket (from Decor Steals) this week and was trying to decide how to use it. Thanks for the inspiration. Best idea that I’ve seen yet. Thanks for sharing. 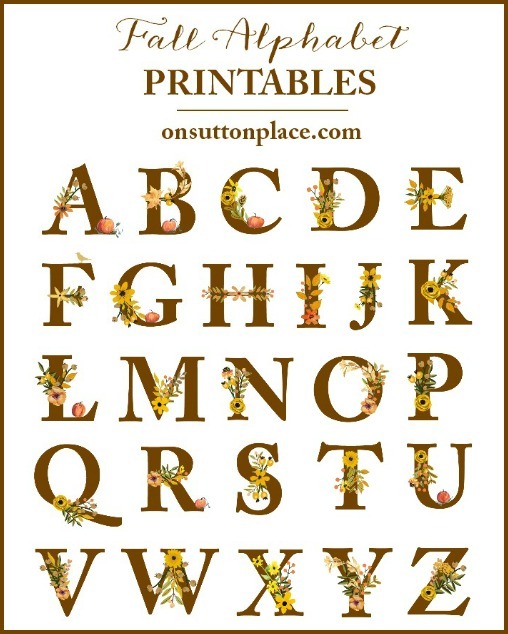 Thanks this seems easy and i love the idea, have a great evening. I love your orangey Autumnal decor with the blue. I need to buy some good faux bittersweet, so lovely. Gorgeous! Love the olive buckets! Will have to give that idea a try. Your entire porch looks so inviting! Great ideas!!! Thanks! Wow! I love this! I think I’ll try it! Thanks for sharing. What a beautiful idea! Love the olive bucket. On the look out for them.???????? Have a blessed day. I really enjoy how you did the Olive Buckets. I am going to get another one for next fall. I did use your prints for fall and hung them up in my entry way. I look forward to to your blogs. Thank you for sharing. I LOVE that idea. Don’t hate me but I bought 5 olive baskets that I found at Good Will for $5.00 each. I only have to get two of the same sized pumpkins because I have everything else. I never would have thought of this so I thank you very much. This makes me want to get out my fall wreath and decorations. I don’t have room for the olive buckets on my tiny porch/stoop but I love them. I’m trying to talk my husband into extending our stoop to make it into a real porch. 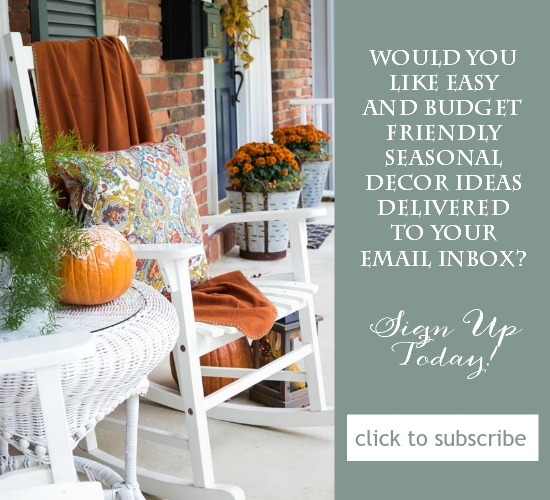 Love all your porch decorating ideas. I love this project! Thanks for sharing! Have a great day! So simple, love the look. I love how you use your olive buckets in many different ways each season. Do you have a supplier for the olive buckets? If you end up ordering please let me know what you think! Love this! 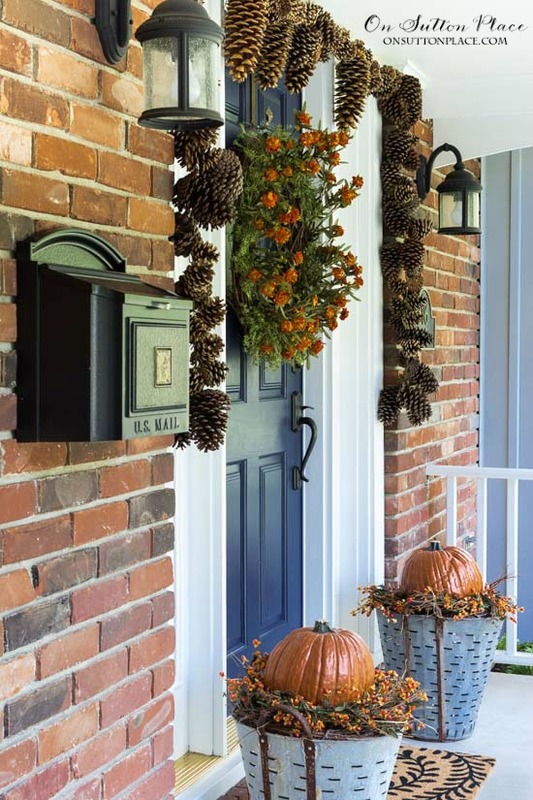 I attempted something similar with grapevine garland, but the wreath is better cuz it “holds” the pumpkin! Thanks Ann! Hi Ann…. Thanks for the fall inspiration, so pretty! Thank you, Ann. I just put a big mum on top of my whiskey barrel planter awaiting what on earth to do around the bottom since it is just sitting on top of the soil. You solved the problem. Yahoo! A very classic look …..and so easy to achieve too ….I will be doing this for sure….I enjoy your postings and look forward to see what is next. Thanks for the DIY on the olive bucket planter, Ann. I’m going to make these for my front porch for sure. I love the look! It definitely screams fall! This idea is excellent. I love the end results. So pretty! Simple enough that I can do it! Oh I love that one Ann. I think I know my decorating for today. And they will look great in the store.